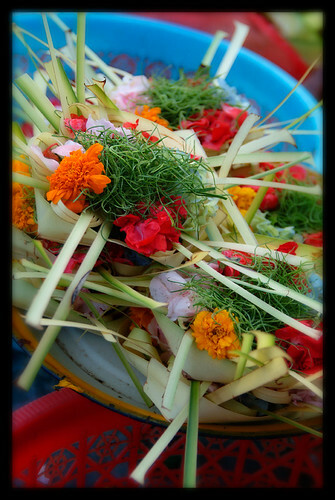 Ceremonial offerings, usually made of palm leaf, flowers, and foodstuffs, are an art form. They are associated with every ritual occasion in Bali. a Balinese Hindu offerings for sale at a local market. These offerings are given to the gods as a token of praise and prayer. In Bali, they represent Siwa (Shiva), while the incense represents Brahma and holy water, Wisnu (Vishnu). The Balinese belief in the forces of the invisible world dictates that offerings be created with a spirit of thankfulness, and loving attention to detail.